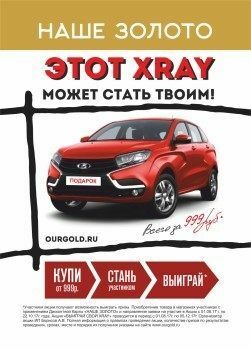 XRAY for 999 rubles? Easily! XRAY for 999 rubles? Easily! We are already playing the THIRD CAR car among buyers! And we increase discounts up to 75%. Do not miss your chance! Make purchases and participate in the drawing of the car and other valuable prizes! The promotion is valid from August 1 to October 28, 2017, information about the organizer, the rules, the number of prizes, the place and the order of their receipt on ourgold.ru. “OUR GOLD” – we charge purchases with bright emotions!